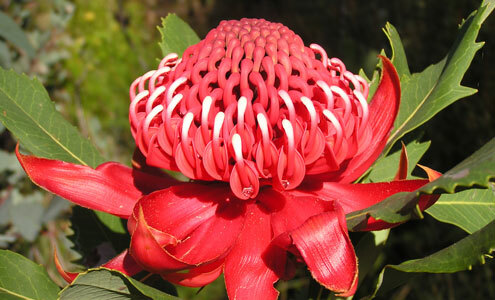 We all love the Waratah, Telopea speciosissima. It is such a thrill to come across the magnificent red flower in the bush. 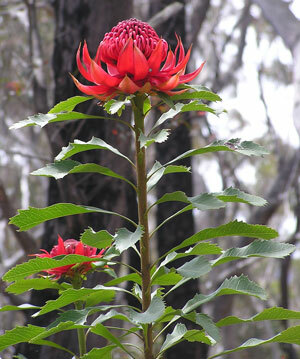 Waratahs were once very common in and around the mountain towns. Can you imagine what a wonderful display they would have made in the springtime? I quote from early mountain newspaper articles supplied by Jim Smith. “Every day witnesses hosts of travellers embarking on the trains laded with the rich ruddy bloom of the State’s most distinctive flower. It is carried into accommodation houses by the armful. It stands in vases in public refreshments rooms. It adorns the mantels of private residences. It is ravished wholesale from remote gullies by motorists. On every hand we watch it being carted away, yet an alleged stringent enactment prohibits it from being plucked between September 1 and November 31. ... The protective (?) ordinance is so faultily worded, that it almost is essential to catch the ravisher in the act to secure a conviction. 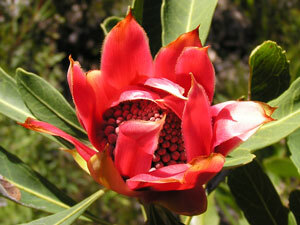 These days the Waratah is protected in our national parks and public reserves. There are places where they can be seen in abundance. However there would be few who can remember that there were multitudes of waratahs easily found “within a few miles of Blackheath station”, or any other mountain town. The article above first appeared in the January, 2003 edition of Hut News and in November 2010 on the Greater Blue Mountains World Heritage Experience website.